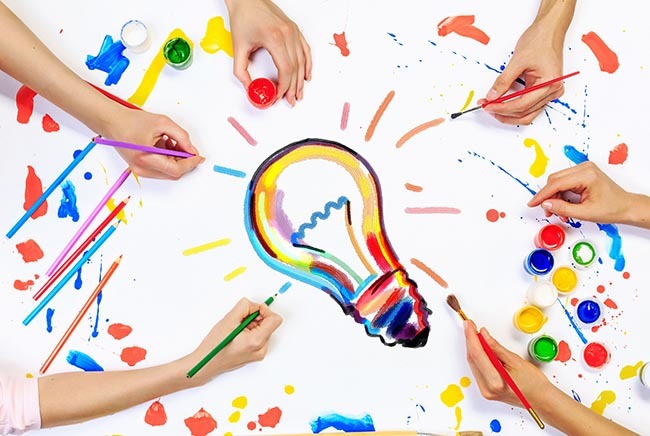 There are methods and techniques of creative thinking. Making these methods and techniques a part of your mental habits will make creative thinking easy and automatic. What if a restaurant didn't have employees? Customers could pay a machine as they enter, and feed themselves at a buffet. If everything was as automated as possible, maybe one owner-operator could run a large restaurant alone. Challenge everything. Do you have to go to work? Do pools need water? Is education always a good thing? Imagining a dog's thoughts about your busyness could clue you in to the unecessary things you do. Thinking dollars-per-day instead of per-hour could give you a plan to let employees go home when they finish a certain quota. Greater efficiency would be almost certain, and you could adjust daily pay and quotas so both you and employees made more money. Look at everything from several perspectives. 3. Let your ideas run wild. Flying furniture seems silly, but it may lead to the idea of a hover-lifter. Slide the device under furniture and it lifts it with a cushion of air, making for easy moving. Don't stifle your creativity. Relax, let ideas come, and know that you can always discard them later.